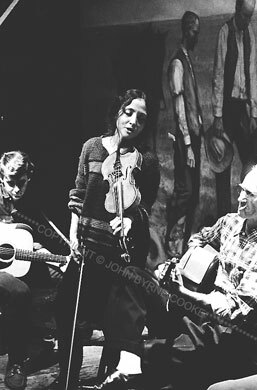 Maria D'Amato played in the Even Dozen Jug Band in New York before moving to Cambridge, joining the Jim Kweskin Jug Band, and marrying Geoff Muldaur. At a music party in artist Harry Jackson's Greenwich Village loft, Maria plays with painter-musician Bob Neuwirth (L.) and old-time guitarist Tex Isley (R.). Visible between Maria and Tex is a fragment of Jackson's painting "The Range Burial," which now hangs in the Buffalo Bill Historical Center in Cody, Wyoming.